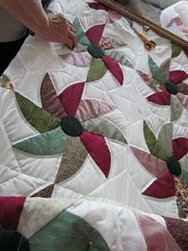 Meet Mary Grace - Mary Grace has quilted so many quilts for the Mennonite Relief Charities and for local Mennonite school fund raisers, that she is well known and respected for her great ability to quilt wonderful trails of stitching on quilts, and also for her generous heart that always ready to share and lend a hand. 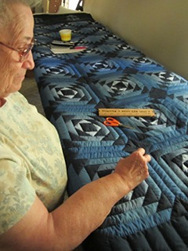 Mary Grace S is the wife of a retired Mennonite preacher, and she with her husband live in their daughter's home with her husband and teenage/adult children, where Mary Grace cooks, and bakes and quilts to her heart's content. Last winter they were able to take the train (they won't fly) down to visit their son and his family for a couple weeks, all the way to Georgia. It was an adventure she cherishes! I believe they've used the bus and now the train to go there, I wonder what will happen next year! Mary Grace S is involved in many quilting bees, and loves being able to go weekly to her church where the Bee Quilt is in frame, and stitch with all her closest friends. Mary Grace S is Mennonite. 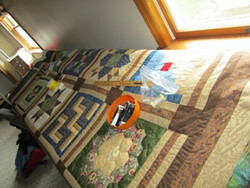 I have included a few photos of her quilting, and two samples of quilts she has done.